References _, synfig::CAIRO, synfig::Surface::clear(), synfig::Layer_Bitmap::csurface, synfig::error(), synfig::ValueBase::get(), synfig::Layer::get_canvas(), synfig::Layer_Bitmap::get_method(), synfig::Layer_Bitmap::height, IMPORT_VALUE, IMPORT_VALUE_PLUS_BEGIN, IMPORT_VALUE_PLUS_END, synfig::info(), synfig::Layer_Bitmap::left, synfig::OPENGL, synfig::ValueBase::set(), synfig::Layer_Composite::set_amount(), synfig::Layer_Bitmap::set_cairo_surface(), synfig::CairoSurface::set_cairo_surface(), synfig::SOFTWARE, synfig::Layer_Bitmap::surface, synfig::Layer_Bitmap::top, synfig::Layer_Bitmap::trimmed, synfig::warning(), and synfig::Layer_Bitmap::width. Referenced by on_canvas_set(), and set_render_method(). References EXPORT_NAME, EXPORT_VALUE, EXPORT_VERSION, synfig::ValueBase::get(), synfig::Layer::get_canvas(), and synfig::type_string. 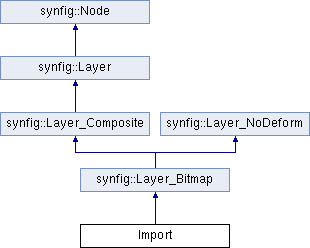 References synfig::CAIRO, synfig::Layer_Bitmap::csurface, synfig::ValueBase::get(), synfig::Layer_Composite::get_amount(), synfig::Layer::get_canvas(), synfig::Layer_Bitmap::get_method(), synfig::Layer_Bitmap::height, synfig::Layer_Bitmap::left, synfig::CairoSurface::map_cairo_image(), synfig::OPENGL, synfig::CairoSurface::set_cairo_surface(), synfig::IndependentContext::set_time(), synfig::SOFTWARE, synfig::Layer_Bitmap::surface, synfig::Layer_Bitmap::top, synfig::Layer_Bitmap::trimmed, and synfig::Layer_Bitmap::width. References synfig::Layer_Bitmap::get_method(), set_param(), and synfig::Context::set_render_method().